Sometimes I am forced to feel very Dutch. Like when I travel in the USA and next stop is announced: Van Buren - oh really - well, there is one difficult vowel in this, but if you learned to speak French or German the u should not be difficult. That is how it works - having difficulty with the name of former prime minister Kok but not realising that the first name of former president Clinton in my language is Buttocks. Taking for granted that the whole world accepts the silly name Bill and giggling about Kok. (Both persons make me feel sad or angry, by the way). Laughing about Herman Van Rompuy means that his predecessor, José Manuel Barroso had a name which was pronounced perfectly all the time. I can assure you, it was not. And actually, I can offer little help with the pronunciation of the name. An approximation of the uy-diphthong (usually spelled ui) can sometimes be heard in Scots pronunciation of ow or ou in general English. And I know no other European language where this diphthong is current - it is a Dutch specialty. Sorry buyt that (not really). "Rompuy" definitely does not rhyme with "pompy" (don't tell me that is why they are rolling over with laughter about the new EU-president at the BBC!). And I can give you an explanation of the meaning of the name. It means "from (a) wide path" - so not from the straight and narrow. A fitting name for a Christian democratic politician. (Not meant to be very personal - and probably the main reason Belgium was chosen is that it is both a member of NATO and defintely not of the Coalition of the Willing to invade Iraq, which would have made mr. Blair vulnerable of getting arrested as the war criminal he is, in quite a few countries - a truth British mainstream media conveniently want to forget). I feel sorry for the people of the Southern Netherlands, since it will be difficult to find a new prime minister willing to preserve the state - which means the risk of having two new states or the even more abject idea of merging the Dutch speaking parts of the historic Netherlands. There is at least one state I want to keep for the time being, for the sake of civilised behaviour. It should not be necessary having to explain this, but I fear few people outside the Low Countries realise what I mean. 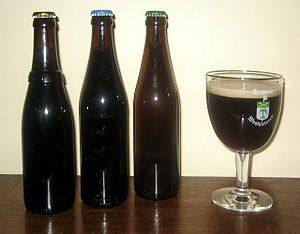 (The three bottles of what is considered by some the best beer in the world symbolise the three official languages spoken in Belgium).